Wednesday night saw the great and the good of UK planning come together for our twelfth (twelfth!) 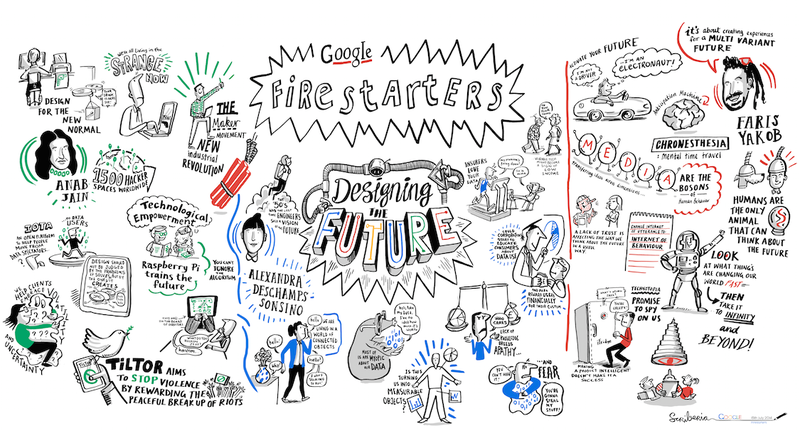 Google Firestarters event, themed around 'Designing for the Future', and we had three amazing speakers who gave three excellent provocations. Anab Jain, TED fellow, founder of Superflux, lecturer at the Royal College of Art (and whose work has been exhibited at MoMA, Apple and the Tate Modern), spoke about designing for the 'new normal'. She described a world of 3D printed guns, DIY drones and amateur space rockets, hackerspaces, crowdsourced innovation and surveillance (including Tiltor, the location-based 'group challenge' service designed to influence crowd behaviour and stop riots). A world where an algorithm gets appointed to the board of a VC firm. A world of technological empowerment. A new normal. Design, said Anab, traditionally uses comfortable and well understood metaphors to cloak novel innovation (skeuomorphism) but this can be like conceptual valium. Designing for the new normal should be about uncloaking the 'strange now' (learning from edge cases or disruptive forces hidden behind those comforting metaphors), and extrapolating current trends to present the full breadth of (often unsettling) future possibilities. Anab gave some examples of work that Superflux are doing in this area including creating a drone aviary, and the fascinating Open Informant project. Alexandra Deschamps-Sonsino followed with a really compelling talk charting the progression of internet of things and how the increasing proliferation of IoT and wearables are turning us all into measurable entities. The data which we generate is becoming increasingly valuable and yet there is no capitalist environment for data. Right now, not knowing the value of what we own, what we produce, what we generate in terms of data is leading a kind of consumer privacy myopia. Alex used the example of Jennifer Lynn Morone Inc, the Royal College of Art student who has turned herself into a corporation and collection of marketable goods and services as a graduation project in Design Interactions designed to determine the value of an individual. She went on to talk about the potential for data to become stigmatised as it is used more and more to determine personalised experiences, policy and pricing (using the insurance industry and the use of wearables to track lifestyle and behaviour as an example). It is therefore crucial that we are really clear about how data is being used (privacy is only an issue when the value of a service is unclear and handling of data lacks transparency), that we build standard communication strategies, that we decide where our responsibility to end-users lies and engage in opt-in behaviours, and that we give people the opportunity to benefit alongside us. Faris gave a hugely energetic talk to finish off, focusing on how we define the future. Humans, he said are to a great extent defined by our ability to imagine future scenarios and it is this that enables us to build that future (and without it there would be no planning). Design is making future in our heads, and how we imagine the future defines what it looks like. He then talked about how difficult it is for us to imagine 'multivariant' future scenarios and how this often results in things that no-one wants (with reference here to the well-worn internet-connected fridge example which has been around for a number of years but has failed in terms of consumer adoption because there is no good use case). And he finished with a lovely thought about how being positive about the future is a lot easier if you like people. Suffice to say that my head was spinning after all that. A number of people mentioned to me afterwards how refreshingly different the event had been and our speakers certainly gave us three very challenging, brilliant and distinctive perspectives on our theme, so my thanks to them, and to Google for hosting of-course. You can see a Storify of the event here, and see the Scriberia visualisation in all it's glory here. Our next event is in September so watch this space or sign up for my newsletter for more news of that.